"On Wednesday, Chris Curtis and another griever visit the scene where his cousin Brandon Curtis, a Springville High School football player, was fatally injured in a rollover accident at the high school on Tuesday. Curtis was later taken off life support and died Wednesday afternoon. Photo taken, Wednesday, July 28, 2010." It's never easy as a photojournalist to cover an accident - especially when it's fatal. On Tuesday, I heard the talk of multiple injuries in Springville. Brandon Curtis, 18, and three other Springville High School students had been hurt in an accident on campus. According to police, all four were injured in a Jeep rollover in the parking lot. The police said the teens had been “spinning doughnuts,” but not at a high speed. On Wednesday, the talk was that Curtis was at Utah Valley Regional Medical Center. Curtis, a football player and wrestler, had spent more than 24-hours in critical condition and on life support. Surrounded by his family, he was later taken off life support and died Wednesday afternoon. Shortly after, I was called by my editor to head to Spingville High School to help tell the story visually. As one could expect, the tensions and emotions were extremely sensitive at the school. I had to work fast to help the community understand the heartbreak, sadness and loss for everyone involved. I tried to show my condolences to staff of the school and students I encountered. But after a couple frames, I, and the other media that were beginning to enter the parking lot, were all told to leave the campus. This made my job difficult to tell story. But I understand that it also gave emotional students more room to grieve. 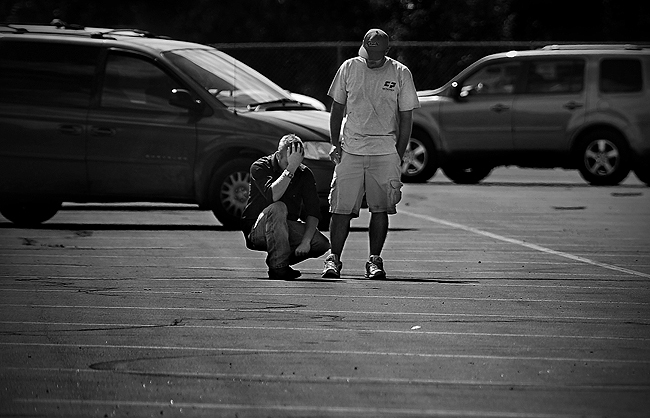 I hope my images helped others in the community understand the pain everyone went through on this very sad day. My heart goes out to the family, friends, teammates, and everyone who knew Brandon Curtis.